WhiteCloud Software Ltd. announced the release of version 4.6 of EAComposer. An innovative and easy-to-use enterprise architecture tool. Use it to manage your IT landscape and technology portfolio. Delivered as a pure SaaS product: cloud hosted with a subscription based license model. The focus of the release was to enable quicker and easier publishing of EAComposer content into the Reference or Standards Library. 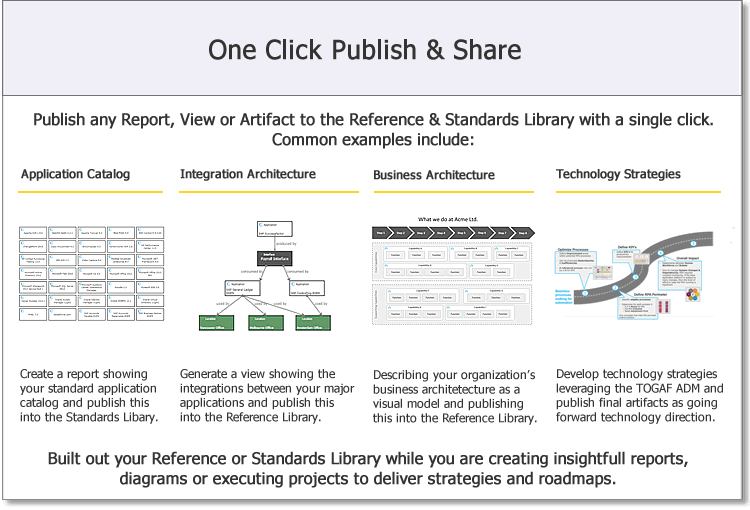 These libraries reflect the published content that is then used across your organization by different stakeholders & audiences. -Publish any Report: Any report can now be published to the Reference Library or Standards Library either as a live-link or as a PDF. Common scenarios for when you might want to do this include publishing a list of standard applications (e.g. Application Catalog) or application function report (also known as an Application Landscape). - Publish any View: Closely related to Reports are Views. They take the visual insight one step further and allow you to create professional, business friendly and graphically enriched diagrams. Common scenarios for publishing views include sharing an end-2-end business model or a system integration architecture . Often a report can be the starting point but then exported as a view to fine tune the visual details and then publish the end result for wider consumption. - Publish any Artifact: EAComposer supports the development strategies and roadmaps using the TOGAF ADM. The Repository is used to manage the existing landscape and overall technology standards. The Initiatives & Projects is used to develop the future. Once the projects complete and the key artifacts are delivered you normally would publish these to the Reference Library. Most common artifacts are Reference Architectures and Roadmaps produced by architecture projects.